Do you find yourself in a legal battle or period of confrontation at this time? We could all do with a friend in high places sometimes as we get discouraged or we feel that we are fighting this battle all alone. Archangel Raguel’s name means FRIEND OF GOD. You are reminded today to ask the Angels for their help in this situation. Ask for balance to be restored, ask for truth, fairness and harmony to be extended to everyone involved. Although we stand up and fight for what is right, we do so with the intention of kindness, love and fairness to prevail. Don’t give up just yet, and don’t feel alone – ask Archangel Raguel to guide you during this situation. Truth and pure intention is what is required at this time. 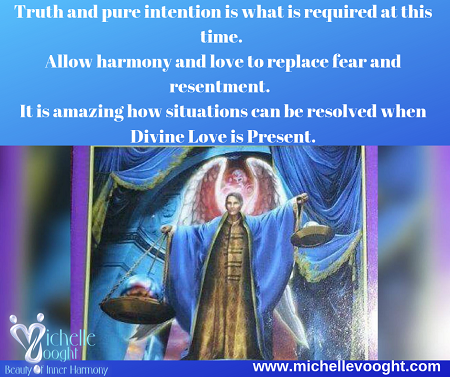 Allow harmony and love to replace fear and resentment. It is amazing how situations can be resolved when Divine Love is Present. “The angels sent you this card as assurance that the right decision will be made! Court cases, settlements, or other issues decided by third parties will be ruled in your favor. Where situations has previously become unfair, Archangel Raguel can help restore balance between the people involved, and you will soon be able to put this challenge behind you. This card also brings a message of empowerment that the situation you find yourself in was partially created by previous choices you made – and therefore, new choices can bring about new results, if you desire! It is very important to make fair and carefully measured decisions at this time. Kindness and justice must always be extended toward everyone involved. Additional meaning: seek equality. Set aside emotion. Do the logical thing. Review legal papers carefully.